The new was updated on March 20, 2019. “During my study in Thailand, I found Thailand is a country with a high happiness index and I got better at hands-on activities,” said a Yunnan girl Li Anan, recalling her studying tour at Kasem Bundit University in Thailand. Along with increasing economic exchanges between Yunnan and Thailand in recent years, the bilateral cooperation in education has got increasingly frequent. The Confucius Institute, jointly established by Yunnan Normal University and Chiang Mai University in December, 2006, was a case in point. 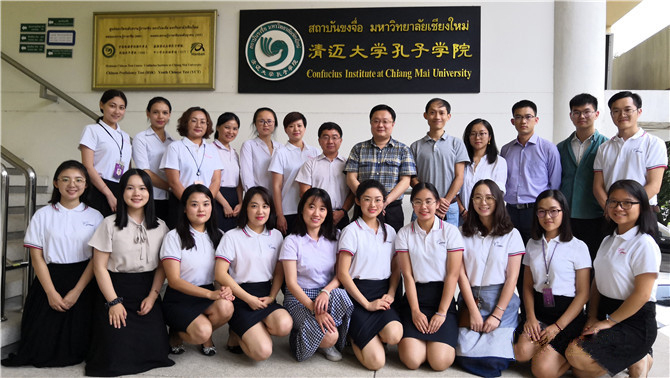 Aiming to serve north Thailand, the Confucius Institute carried out Chinese language teaching, promoting Chinese culture and organizing the HSK Chinese proficiency tests. By 2018, the institute based in Chiang Mai University has opened two Confucius Classrooms, 14 HSK test rooms, 4 community-based culture centers, and 12 Chinese book corners. The Kunming-based Southwest Forestry University has cooperated with the Thai Kasetsart University in Bangkok to carry out exchange programs since 2010. In addition to studying the specialized courses, certain forestry majors in the Kunming-based university are required to study English and Thai languages, so that they can adapt to study at Kasetsart University starting from the fifth semester. Up to now, Southwest Forestry University has sent around 200 students to Thailand in 10 batches. At the same time, the Thai university also sent 150 plus students to the Southwest Forestry University for short-term training. In June 2018, the 3rd Yunnan-Thailand educational cooperatives and exchanges was held in Kunming, during which the Yunnan-Thai university alliance was unveiled. University leaders in Yunnan and Thailand agreed to cooperate in the disciplines of linguistics, tourism, medicine, agriculture, and digital technology.